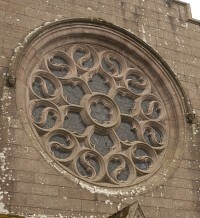 The nave, choir and transepts of Brechin Cathedral were originally built in the first half of the 13th century. 1 The choir was abandoned at the Reformation and fell into ruin, while the nave continued in use for reformed worship. In 1806–7, the transepts and N. porch were demolished and the aisles widened and raised in height, obscuring the clerestory. Inside, a flat ceiling was installed and galleries were introduced on all four sides. A movement for the reversal of these changes and the restoration of the cathedral to its original form was initiated in 1892, and John Honeyman was consulted. Plans were prepared, but work did not commence on site until 1900. The westernmost bays of the choir were reinstated, and the 19th-century aisles demolished and rebuilt along lines closer to the original medieval building. A new N.E. aisle, or transept, was added to increase seating capacity, along with a new N. porch. In 1902 John Honeyman & Keppie designed a house in Brechin, The Mary Acre, for a member of the cathedral restoration committee, Alexander Philip. 1: John Gifford, The Buildings of Scotland: Dundee and Angus, New Haven and London: Yale University Press, 2012, pp. 357–65. 2: Brechin Cathedral archive contains an important group of letters dated between December 1898 and September 1904 (signed by Honeyman or an employee on behalf of John Honeyman & Keppie), as well as estimates, receipts, measurements, press cuttings, and documents related to the fund-raising campaign, meetings of the Executive Committee, and building account. This material is currently (2014) uncatalogued.